Barb is using one strand each of Weeks Dye Works "Lancaster Red" and Crescent Colours "Used Brick." These are her favorite colors this week! She likes to stitch a bit each night. Helps her wind down after a busy day at work. This will be her Christmas sampler this year. Barb's idea for Day 4: Save a bit of time each evening for stitching. I find there are some people who are "real stitchers" and some who are just "wanna-be" stitchers. I think Barb fits into the real stitcher category and I'm a wanna-be. Barb stitches each day. It's part of her daily schedule. It's relaxing for her to pick up a needle and work on a project. I like to think about stitching....I might look at projects and want to stitch them....but just never get around to it. 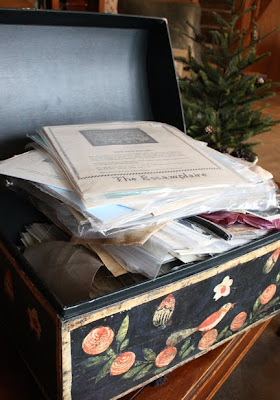 I have stitched quite a few samplers .....but only when there is a deadline or if it's January. 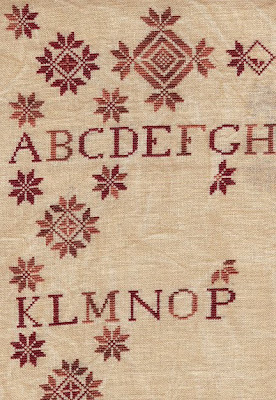 For some reason January seems like the perfect time to stitch a sampler to me. Usually I can finish several in the month. My Idea: Spend 30 minutes looking through your patterns and choose one you would like to begin in January. Here is my "Pandora's Box". Inside I have my collection of cross stitch patterns. When I feel like "working" on a new pattern, I open my stash and look at the one's I've saved through the years. After looking, I feel more relaxed and even a bit excited. I've forgotten some of the designs and it's like seeing them all again anew. I'm going to open the box now....but you have to pinky swear you will never tell anyone how many patterns I have. And here is the shocking part! I really feel no obligation to stitch all of them either. I just love looking at them. Wish you were all here and we could go through them together! Thinking of you all and hope your're enjoying the season! Lynda....I flour the molds so the dough won't stick. I also use the recipe from the book that comes from the molds. Let the cookies dry out several hours on the cookie sheet before baking. I've made them from Gingerbread dough too. But the white ones are my favorites. Use a very deep mold for Shortbread cookies. They typically will not hold a molded design well. Click-on the word Gingerbread dough and it will take you to my web-site showing the darker colored cookies made from Gingerbread. I didn't realize that we were supposed to stitch all the charts in our stashes! I've got my January sampler all picked out... but I'm keeping my pick a secret until New Year's Day. Supposed to stitch all our charts! LOL I'm going to start a sampler Jan. 1 for the Kansas Stitchers SAL. I love your "Pandora's Box", it's so much prettier than my Elfa drawers. Alma, I love your box. When I first saw the pic, I couldn't tell what size it was, then you showed a pic of it open. Wow, I want one! Maybe I'll find me a nice sized box to cover with fabric from your tutorials to put my stash in. I would love to be there and go through your box with you. I'm glad to know that we don't have to stitch everything in our stash. I know I enjoy looking at it quite a bit and dreaming of stitching them. I do the same thing. I have more stash than I could ever finish, but I sure do enjoy just looking at the charts and lovely colors. 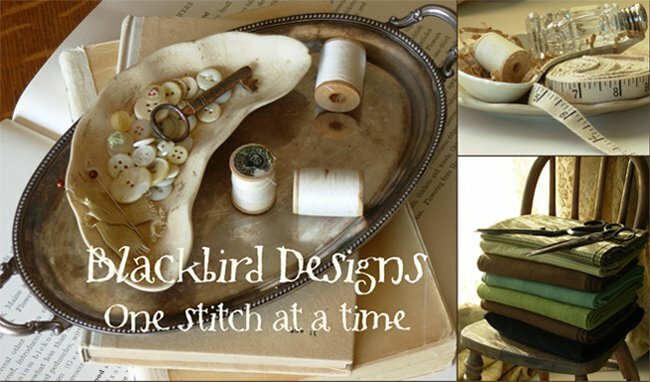 I agree with Barb -- stitching is important for relaxing and feeling happy with the world. lol! As for your stash of charts, ahem! That's nothing! lol! I've got way more than you do! That box is wonderful, so pretty. I'm enjoying the suggestions you and Barb are giving, such fun! Do people really stitch everything in their stash!? I also love looking at all my beautiful charts, I could lose a full day doing so. The chest is very pretty...is there a story behind it? Did you embellish it yourself? Truly enjoying your recent posts. I wanted to stitch today, but couldn't think of what i wanted to make. But, looking at those stitched tags gave me an idea. I patterns for those, so perfect idea for some little sticheries. I am also a wanna be stitcher, oh yes I have stitched some amazing things (mostly smalls) but I give them all away as gifts. I have hardly anything that I have stitched for myself. But I have the sampler I am going to start in Jan, Sarah Tobias!!! Thanks Alma for getting back to me with the name of the samplers. I dont know if I will ever be able to find the older Loose Feathers pattern!!! Thanks Again!!! Calling all bloggers I am having a huge giveaway on my blog and will add a new item everyday until 12/24. Go check it out. OH MY you just helped me discover "why" I love to collect patterns, books of patterns, and magazines--just to look at them---I will take pleasure in that from now on and not feel so "guilty" about my reading stash!!! Thanks! I've bought the fabrics of the Old Primrose Inn for a new project of mine, but I need more different fabrics for this. Do you know a fabricline that fits perfect by the Old Primrose Inn? kind regards Anne from Holland. Barb's WIP is beautiful! I love the colors in it. 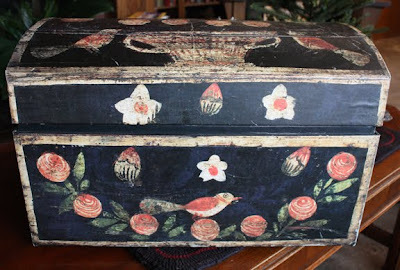 Love the Pandora's Box... it's so much prettier than a Rubbermaid container! Barb's Quaker study is beautiful. The thread colors are rich and warm. Do you know the fabric she is using? Alma: Thank you for admitting you don't intend to ever stitch them all! Now I feel better about my stash which is monster sized! Happy to stay home here and quilt today - we are having wind and ice pellets; but inside, my woodstove is cranking heat, the Christmas music is playing and my coffee is yummy. Gosh it's wonderful seeing another stitches stash of patterns, it makes me feel far more normal. I too enjoy looking through my patterns and I know it will be impossible for me to stitch them all! Alma, where did you get those fabulous molds? What a beautiful box! What fun it would be to go through your stash with you! I also enjoy just going through mine and choosing which one to do next.